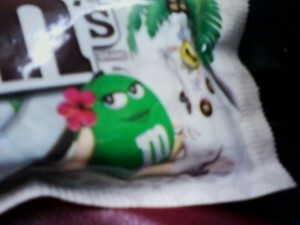 A few of the M&Ms have little beach umbrellas instead of "m"s. Cute! Something about that seems a little unfair to me. If you’re going to make something Limited Edition, limit it. Bring it to the masses and then leave us wanting more, like you always do. By keeping it on shelves well into winter, you’re messing with our heads (and tummies)! Some guys have all the luck. Mr. Yellow isn't one of them. 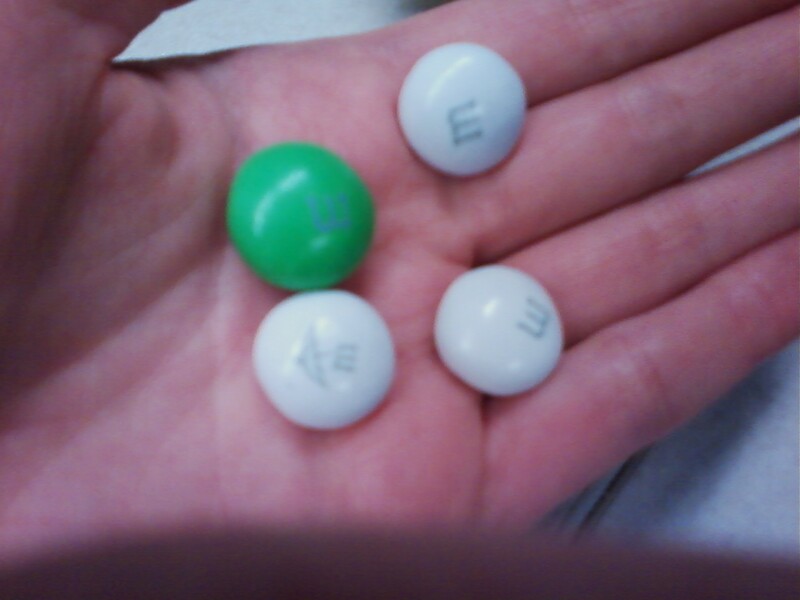 The taste of the M&Ms themselves is interesting… The M&Ms are coconut-flavored (they don’t contain actual coconut), and the flavor is surprisingly strong and “beachy.” I actually had to double-check the ingredients to make sure Banana Boat Tanning Oil didn’t appear anywhere. While I was slightly disappointed with the lack of actual coconut in the product, my fellow snack blogger J. Marcus brought up a good point: you won’t be left picking shreds of coconut out of your teeth later. Unlike my experience with most snacks (ahem, SunChips), by the time I’d gotten to the bottom of the bag, I truly felt I’d had enough. And I don’t think I’ll be craving more anytime soon…. Though, if I change my mind, these “limited edition” goodies might still be on shelves next summer. While I haven’t had these yet (so I’m actually further behind than you, Lauren), the experience seems to remind me of a few years back when Almond Joy decided to go all “Pina Colada” flavored for a while. I will confess that the flavor wasn’t all THAT bad, but when you were done, you didn’t want to go back to that well for quite a while.